St. Joseph's Hospital, Sarnia, Ont. The Sisters of St. Joseph of the Diocese of London had been invited by the Sarnia City Council in 1942 to open a hospital in Sarnia. Initially, the Sisters faced opposition on the part of the Ministerial Association, the Derry Orange Lodge, and some medical personnel. Construction of the hospital began in 1944, and after numerous delays due to shortage of materials and labour during WW II, one floor was finally opened in 1945 to meet the acute need for hospital beds. 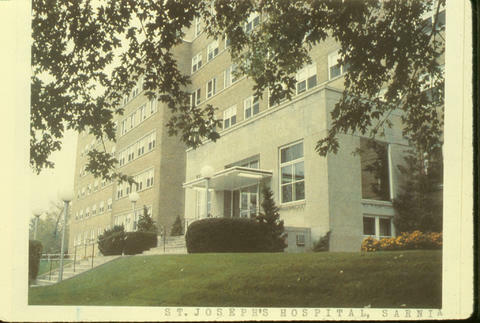 St. Joseph’s Hospital was fully operational with 150 beds on March 1, 1946. The formal opening ceremony for St. Joseph’s Hospital was held on October 18, 1946. The Honourable George A. Drew, Premier of Ontario cut the ribbon. Bishops J.T. Kidd and J.C. Cody (Coadjutor, Bishop), and priests from London and Detroit were present. Officials from other hospitals were also present. The entire million-dollar project was funded by the Sisters of St. Joseph. They received no financial assistance from the government and only a $10,000 grant from the City of Sarnia. The units were filled with both Canadian and American patients from Port Huron and the state of Michigan. The Sisters carried out active nursing roles and administrative duties, notably Sister Pascal Kenny who served as the first Administrator of the hospital. She had previous experience working in operating rooms and administration, and was a member of the American College of Hospital Administrators and of the Board of Governors of the Ontario Hospital Association. In the early days, nursing, technical, and domestic staff were difficult to find. Many of the staff were mothers of families who could only work occasionally. Students from St. Joseph’s Training School of Nursing in London helped fill the nursing rota, and were hired permanently after graduation. Because of the nursing shortage, innovations were made such as the central distribution of medicines and central surgical supply rooms. By September 1948, St. Joseph’s Hospital was better able to provide for patients. A detoxification centre was opened and many alcoholics were treated at the hospital. A clinic for cancer patients was also held regularly at the hospital, overseen by a team from the London Cancer Clinic, who did follow-up checks and therapy. The Auxiliary Radiotherapy and Follow-up Cancer Clinic, the first of its kind in Ontario, was opened in conjunction with the Cancer Treatment and Research Foundation. The late 1950’s saw increased demand for hospital services, which led in 1959, with the advent of government sponsored coverage, a seven-storey, two million dollar addition and an increase of 150 active treatment beds. In 1960, a 45-bed paediatric wing was added. An Intensive Care Unit was opened in 1967, and an Employee Health program was established. The late 1960’s saw the addition of a Social Service Department, and in 1969, a diagnostic radioisotope service. This time period also saw the establishment of District Health Councils. In the 1970s, the hospital needed to update its facilities to meet accreditation standards, as well as to comply with the Sisters’ own standards of care. Because government funding was decreased, Sisters needed to do more independent fundraising. This decade also saw the Ministry of Health deciding to amalgamate hospitals and rationalize services in Lambton County. This became a political issue which meant many hours were spent on discussions with the District Health Council, the Mustard Report, and other tasks. St. Joseph’s Hospital also became embroiled in a confrontation with the Ministry of Health on contentious issues regarding health services, which conflicted with the Catholic faith. The end of this tumultuous period saw the closure of the paediatrics unit and the doubling of obstetrical unit beds. From 1979 onwards, diminishing numbers of Sisters able to take on the responsibilities of hospital management led to the hiring of qualified laypersons, beginning with Frank Bagatto as the Executive Director in June, 1979. In the 1980s, quality assurance became a major focus, and new services such as the chiropody and palliative care were added. The new Chronic Care Facility was financed and completed. In November of 1983, A Memorandum of Understanding between St. Joseph’s Hospital, Sarnia and Sarnia General Hospital was drafted to form the basis for the future planning of each hospital. St. Joseph’s Hospital was officially re-opened as St. Joseph’s Health Centre on October 12, 1990. This was the amalgamation of St. Joseph’s Hospital, the Continuing Care Centre (formerly the Chronic Care Facility), Sarnia-Lambton Workers’ Treatment Centre, and a Day Hospital. The name change reflects a concomitant change in service provision and governance. St. Joseph’s Health Centre no longer served as exclusively as an in-patient treatment centre for the critically ill. It also provided long-term care beds and outpatient treatment. Assets were transferred from the Sisters of St. Joseph to the newly incorporated body of St. Joseph’s Health Services Association of Sarnia. The board of directors of the corporation was now the hospital board, and six Sisters formed the General Administration as members of the corporation which was an un-shared capital corporation. Ownership lay with the corporation while the Sisters maintained final authority over decisions. In January 1995, the Sisters donated their residence at 430 London Road to St. Joseph Health Centre to be used as a hospice. On January 29, 1998, the St. Joseph’s Health Centre joined in partnership with the Charlotte Eleanor Englehart Hospital and the Sarnia General Hospital by signing the Strategic Alliance Agreement. In April 2003, ownership of St. Joseph’s Health Centre was given to the Lambton County Hospital Group. This fonds contains records pertaining to the activities of the hospital and its associated administrators, staff, and organizations, including histories, annals, financial documents, governance records, photographs of people, the buildings and events, and news clippings. The records were transferred from St. Joseph's Hospital to the Congregation of the Sister of St. Joseph in Canada - London site archives. The records are stored off-site in London, Ontario. File and series list available. This fonds is considered closed. Congregation of the Sisters of St. Joseph in Canada Archives. St. Joseph’s Hospital – Sarnia, Ontario. Sister Mary Loyola Drouillard. Memories of St. Joseph’s Hospital – Sarnia. April, 1988. Congregation of the Sisters of St. Joseph in Canada Archives. G. J. Humbert, A Compendium of the Catholic Health Association of Canada, Ottawa: Catholic Health Alliance of Canada. Unknown. St. Joseph’s Hospital now St. Joseph’s Health Centre. Sarnia Gazette, June 29, 1991.